My second observation is merely anecdotal, but the AcuÃ±a & Asociados report places a lot of emphasis on the coastal situation, which has, to some extent, already been â€œfactored inâ€ by most participants, however quite by chance I have talked with a number of people in recent days who have stressed with me just how serious the situation is in the satellite towns around Madrid, built as they have been for Ecuadorians who never arrived, or Romanians who have already left. I think this element is yet awaiting a proper accounting, and the cost is unlikely to be small. Well, “Lo & Behold”, Spanish property portal idealista.com have done a bit of digging, and here is what they found. Going through the official Ministery of Housing data they were able to locate 22 “black spots” (towns or cities with over 25,000 inhabitants) where the price of housing has already reputedly fallen by more than 30% from the December 2007 peak. This compares with the official average price fall of only 8% for the whole of Spain. And incredibly (see the chart below) no less than nine of these “black spots” are in the Autonomous Community of Madrid – that’s roughly 40% of the most severely affected areas nationally are in only one community. The areas affected are AlcalÃ¡ de Henares (-37%), Alcobendes (- 47.6%), AlcorcÃ³n (-34%), Aranjuez (-35%), Colmenar Viejo (-33%), LeganÃ©s (-33%), MÃ³stoles (-33%), Pinto (-37%) and Rozas de Madrid (-35.1%). 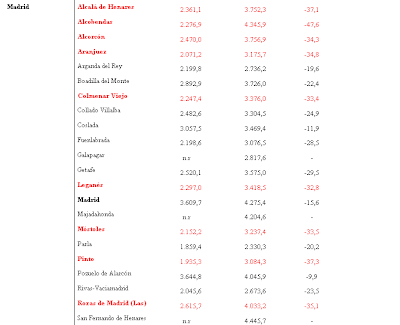 By way of comparison, in Catalonia there are only two such areas, Castelldefels (-33%) and Sant Cugat del VallÃ©s (-32%). Many of the worst affected areas in the Mardid area are in centres of high inward migration, but there are also some quite surprising names, like Alcobendas, one of the richest towns in the whole area, and home the famous neighourhood La Moraleja where so many of Spain’s publicity seeking but camera shy elite seem to find shelter. Of course, it isn’t clear what level of reliability is to be placed on official government statistics, but on the other hand this data does put some flesh on the otherwise anecdotal evidence I have been hearing, or on those reports of trains which stop at stations where no one seems to get either on or off. We are talking about new building with large infrastructural projects to support it here, and of course, as I keep saying, if the immigrants simply walk, who is ever going to live in some of these places? Thanks for the article, very informative (as usual). There was last week a great report in ElMagacine about other places where building has stopped and prices dropped heavily: AVE-commuting town, such as SeseÃ±a, and new subway enabled communities. Looks like Spain is turning into a SeseÃ±a. I don’t check house prices currently (I live in MÃ³stoles), but it sounds plausible. Funny to see the sharp drop in Alcobendas (maybe the end of the “pelotazo” in construction and related activities has also put an end to the golden age of the “new rich”). Oddly, it’s late september and bars and restaurants seem to be in good shape despite the recession, with plenty of clients. My guess is that Madrid (not unlike some regions in the north), while getting hit hard, is stronger (at least now) than the south: unemployment in Andalusia is somewhere near 30% – and Andalusia is larger than Ireland, with 2 million more inhabitants. It’s frightening, I wonder how large is the underground economy there. @rrj: Madrid will probably suffer indirectly (many building and real estate societies had their bases there), but anyway it is (maybe also with Basque Country and some of the north) better positioned to recover. What about Catalonia? The dent in prices looked smaller and the prices are still high. Signs of a still strong economy?